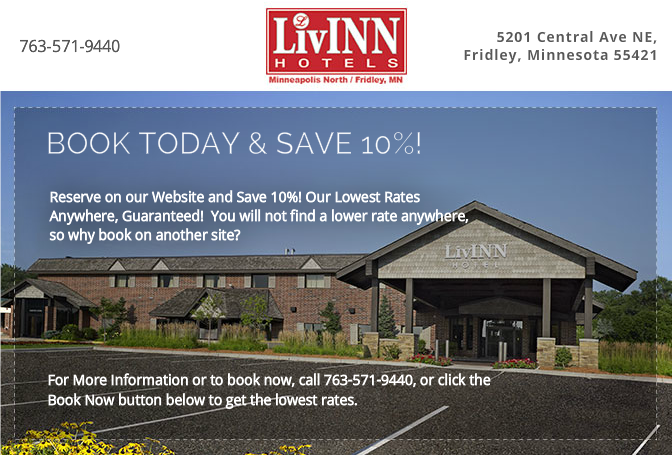 Get even more bang for your hard-earned dollar with this thoughtfully designed hotel deal from LivINN Hotel Minneapolis North/Fridley. Save big on spacious rooms and suites and enjoy a free breakfast, fitness room, meeting space and a beautiful indoor open atrium. Whether you're on the road, traveling for vacation or just need a comfortable place to call home for a while, LivINN Hotel offers you more for less.